The current situation in the US is very reminiscent of our own harvest here in the UK last year, where a very wet August and September dragged the wheat harvest through to the latter half of October in some areas. As we now know that (and poor prices) also saw winter wheat plantings drop sharply in the UK, with significant increases in spring barley and OSR sowings. As we also now know what winter wheat did manage to get into the ground only ultimately returned average yields in the subsequent harvest. Where things differ markedly for US farmers from their UK counterparts twelve months ago however, are the choices left open to them right now. Those with "prevented planting" insurance who are struggling to get their wheat in can claim up to 60% of their expected income from next season's crop, and sit tight and wait for spring. Those without "prevented planting" but with other types of crop insurance, can press ahead with attempting to get their crop into cold, wet, claggy soil. The likely lower yields they may get next season would probably enable them to make some sort of insurance claim, but it would be reduced because the crop was planted later than the optimum timeframe. Those without any insurance at all can simply plant in mud and hope for the best. A more sensible approach surely however would be to sit tight and wait for spring. That brings the option of spring wheat, corn or soybeans - and the knowledge of how prices have fluctuated across the winter. One report on Reuters this week quoted one crop consultant who tracks 10,000 wheat acres in southern Indiana. He said that of those only 700 acres, or 7%, had been planted. And of those 700 he expected 200 to be ripped up and the insurance money banked. It seems like a complete "no-brainer" that wheat acres will be down this year, and in addition the liklihood must also be that what has been planted under adverse conditions will see some detrimental effect on yields come harvest time. Following the lead of Russia, who recently created the new state-owned United Grain Company, Ukraine have announced plans to do likewise. A draft proposal by the Ukrainian Ag Ministry for the formation of the snappily-named Grain of Ukraine is now passing through the approval process in other ministries and departments. The new company will apparently incorporate parts of the State Reserves Committee, the Agrarian Fund and the state-owned company Khlib Ukrainy. Exactly what Grain of Ukraine will market is unclear at this stage, as to the best of my knowledge unlike in Russia, grain intervention in Ukraine is effectively nonexistent because the government has no money to pay for any. If you dig a little deeper though, the move may not be that unusual at all. President of Russia's Grain Union Arkady Zlochevsky recently said that proposals to form a Black Sea Grain Pool between Russia, Ukraine and Kazakhstan will become a reality "sooner or later, it is only the question of time." There's a Presedential election coming up in Ukraine in January, and at this stage the two favourites are Prime Minister Yuliya Tymoshenko, and former president Viktor Yanukovich. Despite an expected field of 20 election candidates this is already being billed as a two-horse race. Yanukovich is currently the leader with 22-27% in the opinion polls, with Tymoshenko next on 13-16%. Whilst Tymoshenko is pro the West and Europe, Yanukovich takes a completely different line saying: “my foreign policy priority will be the restoration of a fully-fledged partnership with Russia,” at his campaign launch. Needless to say Yanukovich will be getting every assistance possible from Moscow to aid his election. If Yanukovich does get the nod, there are plenty who think it will be the precursor for Ukraine splitting in two. With the Russian-speaking east and south becoming a protectorate of Russia and the west and north allied to Poland, Romania and ultimately the EU. That would be unlikely to happen smoothly, and there would undoubtedly be lots of gunfire all round, with Russia ultimately picking up large tracts of fertile land in the east and a useful extra chunk of Black Sea coastline. Now wouldn't that be handy for a Black Sea Grain Pool? In the shorter-term we could see Ukraine depart the stage as an international grain export power as quickly as it stormed it. Suddenly the fact that they are exporting grain at an unprecedented rate, despite a sharply reduced crop this season doesn't seem that strange at all does it? The news that at the rate that they consumed/exported wheat in September, there will be none left in the country by the end of February makes eminent sense. And already things didn't bode too well for next season's harvest, they could look a whole lot worse before too long. November soybean futures closed at $9.78 down 7 ½ cents, December soymeal futures at $297.00, up $1.70 and December soyoil futures at 36.40 cents, down 1.12 points. A firm dollar and weak crude added bearish weakness to beans today. Although immediate US weather forecasts aren't overly friendy, medium term predictions call for more favourable harvest conditions. That seems to be what the market of concentrating on for the time being. December corn futures closed at $3.66, down 13 ½ cents, and March corn at $3.79 ¼, down 13 ¼ cents. The December contract lost 31 3/4 cents for the week. A stronger dollar and weak crude put corn under pressure for the end of the week. The trade seems to be pinning it's hopes on a drier forecast for the first half of November. I'm not entirely convinced, there are other considerations such as disease to take into account. December wheat futures closed at $4.94 ¼, down 9 ½ cents. 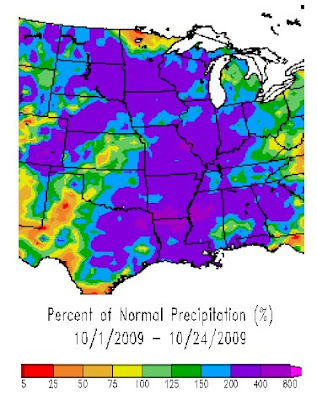 Very wet weather in many parts of the Midwest are seen affecting US winter wheat plantings this season. Today however, the market was concentrating on an improved weather forecast for the first half of November. This will finally facilitate a conclusion to the US soybean and corn harvest and enable most of the planned US winter wheat to get into the ground. At least that is the theory. EU wheat futures continued to mimic Chicago wheat, closing lower Friday with November London feed wheat ending down GBP0.75 at GBP102.00/tonne and Paris November milling wheat EUR3.00 lower at EUR126.75/tonne. There was very little fresh activity or impetus today, front-month November London wheat didn't trade at all during the entire session. Sellers remain reluctant and so too are buyers. The trade remains in a state of flux. Huge uncertainties surround next season's production out of the likes of Ukraine and the US. Whist popular opinion continues to suggest that any rally in wheat is a selling opportunity, EU farmers don't quite seem to see it that way. So we have a classic stand-off situation developing. There seem to be potential problems developing in India, the world's second largest producer and consumer of wheat. A summer drought has led to sharply lower rice production, which it seems may well lead to an increase in wheat consumption on 2009/10. In the UK we will have an increase in domestic consumption once the Ensus plant at Teesside comes on stream at the end of the year. Abengoa are also due to open a similar sized plant in Rotterdam shortly. Vivergo are expected to open another 1MMT+ wheat facility near Hull in summer 2010. Welcome to Britain in the year 2030. A pint of lager is going to set you back GBP18.45, it's almost the same for a litre of corn oil, GBP6.48 for a loaf of bread and over fifteen quid for a packet of rice. Wheat and corn yields in the Americas will fall by 40% and Asian rice yields will be down by 30%. At least that is what could happen unless global governments sort out global warming, according to one report commissioned by the Friends of the Earth. They're understandably unhappy that a quick pop down to the pub in their sandals with Tarquin and Jemima, for a quick pint of Theakston's and a lentil and hummus wrap with be setting them back the thick end of a hundred sheets. How can they afford that? The arse will probably have fallen out Tarquin's niche-market for carved wooden mushrooms by then, and there's a limit to how much hand-made ethnic jewelery that Jemima can knock out. Still they'll probably have saved a few bob on haircuts and soap then. Indian wheat futures have posted another day of fresh contract highs this morning, with front-month November hitting Rs 1,421.10/100kg, that's just over USD300/tonne. Wheat prices have now risen almost 12% this month. Despite protestations to the contrary, maybe that's what the government really want with planting about to begin for the 2010 crop. There's six months to go before that arrives on the market however, so what is going to happen in the meantime? Inflation is surging out of control, rising 1.51% during the week ended October 17, up from the previous week’s annual rise of 1.21%. The Reserve Bank of India (RBI) now predict that wholesale price inflation will reach 6.5% by the end of March, 2010, a significant increase from the previous forecast of 5% and well above its target inflation rate of 3%. Some private forecasts are that Indian inflation will hit 8% by the end of March. Meanwhile consumer price inflation is running at over 10%, with staple foods such as potato prices almost double what they were a year ago, and sugar up by almost 50%. India, typically amongst the world's top three or four rice exporters, is now looking to actively import rice. The government announced a scrap on import tariffs on certain types of rice this week, in an effort to boost supplies after summer drought slashed production. Three state-run agencies have wasted no time in announcing tenders to import 30,000 MT this weekend. It might only be a matter of time before something similar happens with wheat. November soybean futures closed at $9.85 ½, up 17 cents, December soymeal at $295.30, up $4.00 and December soyoil at 37.52 cents, up 66 points. Outside markets helped with crude up almost $2.50, a weak dollar and Wall Street closing almost 200 points higher. Weekly export sales of 691,000 MT were mostly for for China (437,000 MT), and a little above trade estimates. Actual exports for the week were a rather large 1,433,600 MT with China accounting for a monstrous 1,018,500 MT of that. December corn futures closed at $3.79 ½, up 10 ½ cents, March corn finished at $3.92 ½, up 11 cents. A weak dollar and sharply higher crude oil also helped corn. Weekly export sales were however below expectations at 367,200 MT, with exports at 667,000 MT. Rain amounts of 1 to 3 inches are expected to reach southern Illinois, Missouri and Indiana over the next five days before above normal temperatures and below normal rainfall finally enter large parts of the Midwest. December wheat futures were at $5.03 ¾, up 9 cents, off the days highs but still a partial reversal of the performance over the past four sessions. Weekly export sales were a little under trade ideas at 347,700 MT old crop and 18,000 MT new crop. The weak dollar was also a contributory factor. More storms and rain over the next few days will continue to delay the US corn and soybean harvest, increasing the chances of less US winter wheat acres getting sown. EU wheat closed higher, following the US market once again with November London feed wheat ending up GBP2.25 at GBP102.75/tonne and Paris November milling wheat EUR2.25 higher at EUR129.75/tonne. Wheat gained from strong outside markets like crude oil and equities. Crude popped up back above USD80/barrel, around USD2.50 firmer on the day, and Wall Street came in strong, before finally closing just shy of 200 points higher. The International Grains Council raised their forecast for global wheat production in 2009/10 by 1 MMT, but also said that plantings for next season's crop would fall, particularly in the US, on a combination of low prices and a delayed soybean and corn harvest. Indian wheat futures closed at contract highs, close to USD300/tonne, as private stocks dwindle and the government play hardball over the release of state-owned stocks at reasonable levels. The US came out of recession, leaving Britain as the only major economy still officially mired in one, as Q3 GDP expanded by 0.9%. All this talk of growth and better times ahead seems to be encouraging investment funds back into commodities, especially with interest rates at record lows. That doesn't mean that the wheat supply and demand fundamentals have changed though, warn the sceptics. Sellers are however few and far between at current levels, and if you need wheat tomorrow then you have to pay up. Net old crop sales of 347,700 MT were mainly for Taiwan (73,900 MT), Japan (72,800 MT), Thailand (45,000 MT) and Nigeria (43,900 MT. Mexico bought 18,000 MT for delivery in 2010/11. Estimates for export sales report ranged from 400,000 to 600,000 MT. Exports for the week were 430,800 MT. Net sales of 367,200 MT were mainly for for Mexico (90,300 MT), the Dominican Republic (74,000 MT), South Korea (56,200 MT), Peru (41,600 MT) and Taiwan (35,800 MT. Estimates for export sales report ranged from 600,000 and 800,000 MT. Exports for the week were 667,000 MT. Net sales of 691,000 MT were mostly for for China (437,000 MT). Taiwan (70,700 MT), Mexico (41,800 MT), unknown destinations (37,500 MT), Egypt (29,700 MT), Japan (21,000 MT), and Cuba (16,000 MT) were the other takers. Estimates for export sales report ranged from 400,000 to 600,000 MT. Exports for the week were a rather large 1,433,600 MT with China accounting for a monstrous 1,018,500 MT of that. Indian wheat futures have closed at a record high of Rs 1,402.20/100kg, close to USD300/tonne, after the government finally said that they would release 500,000 MT of wheat from state-owned stocks onto the market. The wheat however will only be up for tender at prices above the current cash market, so they might as well not 'offer' it at all. Additionally, I don't see what use half a million tonnes is to a country with a projected annual consumption of 77 million tonnes of the stuff. Cash wheat prices have risen by 10% this month alone, trading at around Rs 1,320/100kg yesterday, equivalent to USD280/tonne). The country's inept government is now under heavy pressure to relax strict regulations on quality issues to allow Indian millers to look to the international market for their requirements. To put them under further pressure a story on Bloomberg today says that the country could be forced to become a net rice importer for the first time in 21 years, after this season's monsoon disaster slashed summer rice production. Who was it who's sudden entry into the world wheat import market in 2006/07 was the precursor for the start of the biggest wheat rally in history again? Poor old cash-strapped Ukraine are so desperate for foreign spondoolies that they've recently been shipping grain like it's going out of style. Having already exported around half of their planned 16.7 MMT of grains in the marketing year, which only started in July, the Ag Ministry have now upped their estimate for exports this MY to 20 MMT. Ukraine grain consumers must be running around trying to nail their wheat to the floor at the moment, for fear of it being whisked away against their will and put on a boat bound for some foreign land whilst they'd only just popped out for a coffee. If ever a country was in a mess then Ukraine is surely it. Not so much a disaster waiting to happen, as one happening before your eyes. They appear not to have noticed that grain production this season is down by almost 20%. They also don't seem to have spotted that at the rate they are consuming and exporting wheat (2.75 MMT in September alone), their Oct 1st wheat stocks of 13 MMT will be gone by the end of February. Neither do they seem to have spotted that the 2010 winter wheat crop has got off to a terrible start. Some estimates for next season's production are as low as 13-14 MMT (it was 25.9 MMT as recently as 2008), and they consume 12 MMT domestically themselves. Meanwhile shares in Ukraine farming giant Landkom International slumped to an all-time low of 5.56 pence each yesterday, a fall of over 70% in little more than two months. Landkom recently abandoned merger plans, instead announcing a plan to raise GBP9.8 million by floating 195 million new ordinary shares at 5 pence each. Landkom said that the money would be used in part to "meet its current financial obligations and ensure that the approximately 23,000 hectares (ha) of crops already planted can be properly maintained to harvest." No, not Iceland the frozen food store. Iceland the place, the land of the midnight sun where your local council deposited your council tax money. All three Icelandic McDonalds are in the capital of Reykjavik, and they're all closing down after the collapse of the local krona pushed the price of a Big Mac to the most expensive in the world. The local franchisee says he is bound under the terms of his agreement with the Golden Arches to import all the constituents of a Big Mac, even down to the box, from Germany. New price hikes would push the cost of a Big Mac up to almost four quid, meaning that he can't compete with others using locally-sourced materials, he says. November soybeans closed at $9.68 ½, down 5 cents, December soymeal at $291.30, up $3.70, and December soyoil at 36.86, down 62 points. The trade continues to focus on an improved weather outlook for the first fortnight in November. Estimates for tomorrow's export sales report range from 400,000 to 600,000 MT. Crude oil fell sharply, closing almost $2.50 lower, close to $77/barrel. December corn finished at $3.69, down 1 ¾ cents, and March at $3.81 ½, down 1 ½ cents. Estimates for tomorrow's weekly export sales report range between 600,000 and 800,000 MT. Last week sales were a dismal 249,500 MT. The US Energy Dept said crude oil stocks rose 800,000 barrels last week to 339.9 million barrels. That was less than anticipated, but with gasoline stockpiles up 1.7 million barrels, crude oil declined to almost $77/barrel. December wheat settled at $4.94 ¾, down 8 ½ cents. Wheat traded both sides today, but finished up weaker again despite reports that farmers may elect to use their prevent plant insurance due to cooler ground temps and muddy fields rather than attempt to plant wheat under those conditions. Weekly exports sales estimates for tomorrow range from 400,000 to 600,000 MT. Last week's sales were 685,100 MT. EU wheat futures continued to slide Wednesday with Paris November milling wheat futures ending down EUR0.25 at EUR127.50/tonne, and London November feed wheat closing down GBP1.25 at GBP100.50/tonne. It was another day of following the US markets, with Chicago wheat ending sharply lower last night and continuing to drift during the day today. Farmer selling reportedly picked up considerably last week as EU futures rallied to three-month highs, but growers may have tempered their ideas again now that selling levels are around a fiver off their recent highs. It's all about currency and America at the moment, that is what is driving EU futures prices. Although US prices have dipped off this week, I'm not so sure that this is a long-term trend developing. Plenty of reports I am reading suggest that US farmers will be financially better of taking the insurance money, rather than planting wheat. Others suggest that, as temperatures across Kansas have been several degrees below normal throughout October, coupled with above average precipitation, this has prevented many farmers from finishing wheat planting in the state that produces around a quarter of the entire US wheat crop. The overnight's extended the declines of the past few sessions, with beans closing around 10 cents lower, corn down 5-7 cents and wheat down 9-10 cents. The US weather seems to have, or be about to, provide a window of opportunity for farmers to try and get corn and soybeans harvested. Those that can't get onto the land just yet might fare better next week, as a favourable period should extend through the first week of November, most forecasts are saying. Before that a “very wet” storm will cross the Plains, Corn Belt and Delta over the next four days bringing heavy snow and strong winds to the Northern and Central Plains and flooding rains to the Mississippi Valley. A drier (and warmer) period begins next week becoming more widespread the following week, says Allen Motew of QT Weather. The American Petroleum Institute surprised the market yesterday by saying that US crude oil stocks fell by 3.5 million barrels last week, the market had been expecting an increase of 1.4-1.8 million. The US Energy Information Administration release their report at 14.30 GMT this afternoon. Mastercard said yesterday that gasoline demand rose 5.1% year-on-year last week. Some of this week's sharp declines could be attributable to the fact that the calender year for mutual funds and hedge funds ends on October 30. That frequently makes the last week of October a volatile one in all the markets. Temperatures across Kansas have been several degrees below normal throughout October. This, coupled with above average precipitation, has prevented many farmers from finishing wheat planting, according to Kansas Wheat. Early calls for this afternoon's CBOT session: corn called 5 to 7 lower; soybeans called 8 to 12 lower; wheat called 8 to 10 lower. Here's an interesting story, reporting on the demise of rice production in India and the Philippines where adverse weather conditions have hit this years crops hard. "We are not very far off from possibly another rerun of 2008"
...in India. Yes, despite Chicago wheat falling out of bed this past few sessions, wheat futures in India are setting fresh contract highs this morning. Why? Well it maybe won't surprise you to hear that the government STILL aren't releasing any of their state-owned stocks. Wheat futures hit Rs 1,376/100kg today, that's the equivalent of around USD290/tonne, considerably higher than milling wheat prices on the international market. Last week a report in the Hindu Business Line said that the government had finally agreed to set the minimum tender price for wheat from it's reserves at Rs 1,379.70 - Rs 1,728.23/100kg (USD292-USD365/tonne). Needless to say, local millers are baulking at paying the government such inflated levels with world prices substantially cheaper. So why don't the millers just get on with it and start buying on the international market? The answer is the strict government-imposed quality restrictions. "As a first step, the private trade should be allowed to import wheat...to ensure orderly arrivals, phyto-sanitary restrictions in place will have to be suspended for some time," says the Hindu Business Line. "In what currently seems to be an unlikely event of the (2010) Indian wheat crop turning out to be normal or even near normal, the commercial risk of wheat imports is on the private trade. Import of 2-3 million tonnes during the next six months will prove beneficial from the point of view of additional supplies and reining in open market prices," the report concludes. It may be that the Indian government are waiting to see how winter wheat planting progresses in November following the harvest of the late summer rice crop. Wheat consumption in India is seen at a record 77 million tonnes in 2009/10, following a 15-16 million tonnes drop in summer rice production. It will be interesting to see if the government are prepared to relax the rules to allow millers to import wheat, or continue to hold a gun to their heads forcing them to buy state-owned stocks at prices well above the global market. Certainly the latter would do little to help the government achieve their publicly-stated aim of curbing food price inflation. November soybean close at $9.73 ½, down 13 cents, December soybean meal at USD287.60, down USD7.20 and December soybean oil at 37.48, down 15 points. Soybean prices finished lower for the third day in a row, declining to two-week lows on a favourable harvest weather outlooks for next week where above normal temperatures and normal rainfall are predicted. The market seems to be content to focus on next week's forecasts rather than more rain (and snow) on the radar for this week. December corn closed at $3.70 ¾, down 7 ¼ cents, with March at $3.83, down 7 cents. As with soybeans the market is looking at a warmer and drier forecast for next week, rather than yet more rain for the remainder of October. A firmer dollar also put corn under pressure. Disease and the high moisture content in Eastern Midwest corn, where maturity was seriously delayed, is causing moldy kernels in corn that pose special challenges for grain handling and storage, say Martell Crop Projections. Wheat was the weakest of the three, closing at 5.03 ¼, down 23 ¾ cents. CBOT wheat has dropped over 70 cents the past three days, along with the rise in the US Dollar. Hard red winter wheat was rated 67% good to excellent, 19% fair and only 4% poor by the USDA last night. US winter wheat plantings were 76% done vs 85% normally, with the two main causes for concern Illinois at 33% vs 82% normally, and Indiana at 43% vs 83% on average. Rainfall on the High Plains has been generous promoting favourable early growth, say Martell Crop Projections. EU wheat futures followed the US market lower Tuesday, with Paris November milling wheat futures ending down EUR1.25 at EUR127.75/tonne, and London November feed wheat closing down GBP1.75 at GBP101.75/tonne. A firmer dollar tempered some of the losses, but the over-riding factor today was weakness in the Chicago wheat market which spilled over into European trade. CBOT wheat has put in an impressive performance this month, rising by more than a dollar a bushel on planting concerns in the US. An improved weather outlook for the beginning of November however has seen it give up almost half of those gains over the last few sessions. Last night's news from the USDA that US winter wheat plantings were 76% done vs 85% normally, would appear to indicate that things aren't as bad as the market had been thinking. Export interest for EU wheat is still hard to come by with the dollar falling to a 14-month low against the euro recently helping to improve the competitiveness of US wheat on the export arena. Meanwhile Ukraine continues to export at a record pace, despite a grain crop almost 20% lower this season. Just sixteen weeks into the 2009/10 marketing year they have already exported almost half their entire forecast of 16.7 MMT for the year. Drying over 400 million tonnes of soaking wet US corn and soybeans will use up a fair bit of energy! Some reports I've read suggest that the late harvest could almost be viewed as a blessing, in so much as if the crop was all to come in off the fields tomorrow there simply wouldn't be enough drying capacity to handle it all in one go. Shortage of drying facilities is a problem of varying magnitude too, depending on where you are, according to some reports I am reading. In addition farmers' bottom lines will be taking a severe hit at around 1.5% shrinkage and 2.5-4.0 cents per point to dry it common at many elevators. Others report 7-8 cents per point drying without shrinkage. In some ways all very reminiscent of our own grain harvest in the UK twelve months ago. The overnight markets closed mixed to slightly lower, with wheat down 3-4 cents, corn 1-2 cents lower and soybeans unchanged to a cent or so higher. The USDA last night pegged 44% of the soybean crop as harvested as of Sunday, in the middle of trade estimates of 40-50%, corn harvesting only advance three points to just 20% - towards the low end of expectations. US winter wheat plantings were 76% done vs 85% normally, with the two main causes for concern Illinois at 33% vs 82% normally, and Indiana at 43% vs 83% on average. High relative humidity, strong winds, snow and rain will keep the snail’s pace harvest on a slow-track for yet another five to seven days. The first days of November though show some improvement, says Allen Motew of QT Weather. It's this November improvement that the trade seemed to be largely focusing on last night and again this morning. Crude oil fell out of bed yesterday, dipping back below USD80/barrel on ideas that stocks data from the API and EIA, due today and tomorrow, will show inventories are back on the increase. The trade is still struggling to balance potentially record large corn and soybean production against unprecedented delays in harvesting. Whilst the corn harvest only advanced 3 points last week, soybeans moved ahead by 14 points. This would appear to indicate that farmers view beans as the most likely to vulnerable to further crop and quality problems just at the moment. Many US farm message boards are full of farmers posts complaining about how high current moisture levels currently are (up to 35%), and the associated hefty drying charges that they are likely to incur. Early calls for this afternoon's CBOT session: corn called flat to 2 lower; soybeans called mixed; wheat called 2 to 4 lower. Brazilian President Lula da Silva has approved a proposal to increase the biofuel content of it's diesel to 5% up from 4% previously. The measure, which takes effect in January 2010, is expected to raise the production of biodiesel in Brazil to 2.4 billion litres next year. Lula da Silva cautioned the industry not to rely on edible soy oil as the main feedstock to make it however, so it would not impact on food supplies. Brazil has used its status as the world's top sugar producer to promote cane-derived ethanol. Its flex-fuel cars, launched in 2003, incorporate technology enabling them to run solely on ethanol, gasoline, or any mixture of both. With an under-developed rail network and huge cargoes of agricultural and mineral production travelling thousands of kilometres by road to the country's ports, diesel consumption is a major cost for Brazilian industry. The Indian government has put a 12-month waiver on the 70% import tax imposed on certain types of rice, in an effort to encourage more imports following reports that this years summer-sown rice crop would decline by 15-16 MMT, or around 18%, on last year's output. The move is just the latest by a desperate government to stave off spiraling food price inflation. Having already tinkered with regulations on sugar stocks - "to prevent hoarding" - the government finally announced last week, after months of badgering, that they would invite tenders for state-owned wheat stocks. What surprised the market was that, despite supposedly having 30 MMT of wheat in store, the government wanted levels substantially higher than existing domestic prices. Today, Farm Secretary T. Nanda Kumar, has boldly announced that the country is targeting to produce 82 MMT of wheat in 2010 (planting begins in November). He didn't provide any details on exactly how India would pull off this coup following the country's worst monsoon rains in 37 years this summer. As food security becomes more of an issue in the world's second most populous country local businesses are eying other countries ambitions abroad. The Solvent Extractors’ Association (SEA) of India, a body of over 800 edible oil producing companies, is urging the government to follow China's lead and buy land abroad for food production. They fancy South America where, they say, the cost of land is far cheaper than in India's breadbasket states like Punjab. After crude oil, edible oil imports are the largest foreign exchange drain in India. Imports of vegetable oils during November 2008 to September 2009 jumped 47% to 79,000 MT from 54,000 MT during the same period a year ago. The SEA would like the government to "smooth" a USD85 million loan from the Exim Bank of India to facilitate the purchase of an initial tranche of 10,000 hectares of productive land in Paraguay and Uruguay. The government however don't seem to be listening, preferring to keep their money in their pockets, their grain under lock & key and believe in their own spin on food stocks & production estimates. Ukraine has harvested 43.3 MMT of grain in bunker weight to Oct 23, according to the Agriculture Ministry. Yields this season have averaged 2.96 MT/ha, down 15.4% on 3.5 MT/ha last season, they add. The wheat harvest to date is 21.6 MMT, and the barley harvest 12.7 MMT. The corn harvest still needs to be wrapped up, but has currently produced 5.6 MMT. All tonnages are in bunker weight. The country has also harvested 6 MMT of sunflower, and 504,000 MT of soybeans to date, with both harvests also still ongoing. The Ministry forecast that this season's grain harvest will total 42.9 MMT in clean weight, a shortfall of almost 20% on the 53.3 MMT produced last year. Despite output being sharply lower, grain exports in the current marketing year (to Oct 22) stand at 8.2 MMT, 2.5% higher than twelve months ago. Wheat exports are at 4.5 MMT, 9% up on year ago levels. Barley exports are 15% down at 2.93 MMT, and rapeseed export down by a third at 940,000 MT. Total grain exports this season will be 16.7 MMT, say the Ag Ministry, a little over a third down on the 25.2 MMT exported in the previous marketing year. With 8.2 MMT exported already, that means that Ukraine are already almost halfway through their 2009/10 export program after only 16 weeks of the marketing year. Either exports will dry up significantly in the second half, or their forecast is woefully understated. What's the likes of Sudan, Pakistan, Madagascar, the Philippines, Ethiopia, the Democratic Republic of Congo and Zimbabwe got in common? Poverty, hunger, corruption? That's probably correct, but not the answer I was looking for. The answer is that despite not being able to feed themselves, they are all fully prepared to sell of vast areas of their homeland to eager foreign buyers. Rich investors in countries such as China, Saudi Arabia, Kuwait, Bahrain, South Africa and the United Arab Emirates (UAE) are buying - or negotiating to buy - land from at best desperate, and at worst corrupt, governments in all these countries. The FAO says that about one billion people are currently living in hunger or are undernourished, including 100 million added to the total after the recent global financial crisis. The largest number, about 642 million, is in Asia Pacific, followed by 265 million in sub-Saharan Africa. In contrast, only about 15 million people live in hunger or remain undernourished in the industrial world. Yet Saudi Arabia says it is in negotiations with Pakistan to lease an area of farmland twice the size of Hong Kong to grow wheat, fruit and vegetables. More than half a million acres of farmland in the DR Congo are about to be signed over to South Africa in phase one of a deal which could see much more of DR Congo's underused 25 million acres 'given' rent-free to South African farmers. The Bahraini agriculture ministry has reportedly secured an agreement from its Filipino counterpart for Bahraini investment in the Philippines' agricultural sector. Given Bahrain's need for food supplies and the Philippines' need for foreign investment, such agreements are being presented as win-win deals. In Zimbabwe, as you might imagine, things are even worse. China were able to swap F-1 jetfighters, armoured vehicles and an assortment of weapons for precious metals, diamonds and most importantly farmland, in the uproar surrounding Mugabe's refusal to acknowledge election defeat by arch-rival Morgan Tsvangirai. Workers complain that their new Chinese employers either do not pay them at all, or only pay them a pittance. Management positions are exclusively reserved for fellow Chinese. China also recently announced that it is providing $7.9 billion in ‘loans’ to the Camara military junta that recently took power in Guinea through a coup d’etat. But who really is winning in these win-win deals? Certainly not the farmers who are having their land seized. Here today and gone tomorrow governments are selling their souls to the Devil, swapping a bit of short-term gain in exchange for long-term pain. The main thrust of investment isn't coming from those interested in long-term food security either. It's multi-national conglomerates looking to make money on the international commodity markets. And where is all the water going to come from to irrigate these crops in this deeply immoral practice? Redirected away from the local watercourses no doubt, we might as well just go the whole hog and bring back slavery. November soybean futures closed at $9.86 ½, down 19 ½ cents, December soymeal futures at $294.80, down $8.50, December soy oil futures closed at 37.63 cents, down 31 points. A drier outlook for the week ahead was blamed for a sharp sell-off today, although some forecasters are saying that this will be confined to the western half of the Midwest. The USDA pegged 44% of the soybean crop as harvested as of Sunday, in the middle fo trade estimates of 40-50%. This is still sharply lower than the five year average of 80% done at this time of year however. Top producing state of Iowa is only 47% vs 91% normally, Illinois is 33% vs 86% normally. December wheat futures settled at $5.27, down 20 ¾ cents. The USDA report US winter wheat plantings at 76% done vs 85% normally. Illinois is 33% vs 82% normally and Indiana 43% vs 83%. Top producing state of Kansas also lags by 9 points at 80%. A drier outlook in the west might help winter wheat sowing advance this week. Earlier today the USDA reported that 14.336 million bushels of wheat were inspected for export for the previous week, which fell within trade estimates ranging from 15 to 20 M bu. EU wheat began the week in consolatory mode after posting significant gains over the past few weeks. Paris November milling wheat ended down EUR3 at EUR129/tonne, and London November feed wheat closed down GBP2 at GBP103.50/tonne. The market began the day firmer, following higher US trade on the overnight eCBOT market. However as the US market slumped sharply lower shortly after the opening, EU wheat was dragged lower with it. US wheat posted sharp gains last week as the soybean and corn harvest lags, potentially reducing winter wheat acres. A slightly improved US weather outlook this week was sufficient this afternoon to send soy, corn and wheat futures tumbling. That was all it took to send EU wheat into retreat. Falling stocks and a weak crude oil market also weighed on wheat today. Export interest remains scant, with Ukraine picking up three cargoes of feed wheat tender business to the Philippines over the weekend. Russia will begin grain intervention purchases on Nov 2nd, but the amount of money allocated to such buying this year is only likely to be 25% of what was available last year. The overnights closed firmer, with beans up around 3-5 cents, wheat around 5 cents higher and corn up 1-2 cents. Prices had traded even higher earlier in the overnight session, on news that this week's weather forecast appears to have more rain in it for the Midwest than was evident on Friday. The trade is trying to balance potentially record crops, with the extremely late harvest. Whilst some analysts continue to talk of bumper yields, other report mould, disease and, in the case of soybeans, pod splitting. The USDA will report after the close tonight on the latest harvest progress and crop conditions as of Sunday. The trade expects corn to be 20-25% harvested, only a fraction higher than last week's 17%. The bean harvest is thought to have moved on from 30% to around 40-50% done. Winter wheat plantings are also expected to continue to lag, particularly in Illinois and Indiana. There's not a lot of change to the dollar or crude oil so far today. Wall Street is seen opening a tad firmer, in line with European stocks which are also fractionally higher. Early calls for this afternoon's CBOT session: corn called steady to 2 higher; beans called 2 to 4 higher; wheat called 3 to 5 higher. Note: Chicago will open at 14.30 and close at 18.15 UK time after we returned from BST over the weekend. As I've just done with corn, now let's have a look at the top five US soybean producing states. The same top five corn producers are also the top five soybean growers too. Iowa is also the biggest bean state with an anticipated 15.2% of the national crop this year. After that comes Illinois with 12.6%, then Minnesota with 8.7%, Nebraska at 7.6% and finally Indiana with 7.1%. These states combined therefore account for just over half (51.2%) of national output. Harvesting was just 37% done in Iowa, against 85% normally, as at Sunday 18th. Things were even worse in Illinois at 13% complete compared to 79% on average. Elsewhere we had Minnesota at 34% (83%), Nebraska at 55% (75%) and Indiana at 27% (72%). As with corn, we can pick out Illinois and Indiana as being the two states with the biggest problems. They've had plenty of rain in the past week, and there's another good dose in the forecast through to Thursday this week. These two states are also the furthest behind with winter wheat plantings: Illinois 13% complete compared with 67% normally and Indiana 22% done (69% on average). Trade talk for tonight's USDA crop progress report is that nationally the soybean crop will be 40-50% harvested, from 30% done last Sunday. Seldom has a USDA crop progress report been so important as tonight's will be. Last week's report showed that only 83% of the corn crop was mature as of last Sunday, compared to 97% normally. Just 17% of the corn crop had been harvested. Let's have a look at the top five US corn states. Iowa is the biggest with an anticipated crop of 2.5 billion bushels (or over 19% of the national crop) this year according to the USDA's Oct 9th Crop Production report. After that comes Illinois with 2.1 billion bushels (16%), the Nebraska at 1.6 billion (12%), Minnesota with 1.2 billion bushels (9%) and Indiana with 900 million (7%). These states combined therefore account for almost two thirds (63%) of national output. If we look at maturity here we see Iowa doing OK last week at 93% (98% normally). But the other four are all well behind: Illinois 79% (99%); Nebraska 78% (94%); Minnesota 84% (97%) and Indiana 77% (96%). Harvesting in all five was also well behind: Iowa 10% (33%); Illinois 11% (68%); Nebraska 13% (34%); Minnesota 3% (31%) and Indiana 15% (49%). Another stormy week is on tap for this week, with widespread 1-2 inch rains (some 3-5-inch totals too), gusty winds and more snow, say QT Weather. Iowa, Nebraska and Minnesota appear to have a small window of opportunity now through to Wednesday, before a strong storm moves into the area Thursday. Further east Illinois and Indiana have rain in the forecast every day through to Thursday. Trade talk for tonight's USDA crop progress report is that nationally the corn crop will be 20-25% harvested, from 17% done last Sunday. The overnight markets are higher across the board, reversing Friday's late sell-off as the latest weather forecasts emerging from the US call for more rain and snow this week. The USDA will report on harvest progress after the close of CBOT tonight. Only 30% of the soybean crop and 17% of corn was harvested as of last Sunday. As well as making exceptionally slow progress with the harvest - mould, disease and lodging problems are also threatening yields and quality. Wheat planting is also stalled. The Philippines have bought 133,000 MT of Ukraine feed wheat at USD210 C&F. They are also in the market for rice after recent typhoons wiped out a substantial quantity of local paddy fields. Feed production in China during September was up more than 17% on a year ago, according to China National Grain & Oils Information Centre. Russia will start grain intervention on will start on November 2, according to Ag Minister Elena Skrynnik. It seems unlikely that they will buy as much as the estimated 8.6-9.6 MMT that they purchased last year though. The dollar has set a new 14-month low against the euro this morning, falling to 1.5062. November soybeans closed at $10.06, up ½ cent, December soybean meal at $303.30, up $2.50 and December soybean oil at 37.94, down 36 points. Profit-taking and pre-weekend position squaring trimmed early gains, even so soybeans still closed 32 cents higher for the week. October looks set to be the wettest on record in the US by the time next week's forecast storms have passed, making the soybean harvest one of the most difficult, and certainly the slowest, for many years. Iowa, Illinois and Indiana are the top soybean producing states and as of last Sunday they were only 37%, 13% and 27% harvested respectively. December corn closed at $3.97 ¾, down 5 ¾ cents. Having traded higher most of the session, a late pre-weekend sell-off trimmed corn's gains, but December still closed almost 26 cents higher than last week. Weather forecasts continue to call for above normal precipitation through November 6th for most of the eastern US with much below normal temperatures. Meanwhile crop quality continued to deteriorate in this cold and damp environment. The USDA will report Monday night on harvest progress, it might not make pleasant reading. Wheat closed at 5.47 ¾, down 4 cents, despite having been sharply higher most of the session. As with beans and corn, a late sell-off trimmed early gains which had propelled wheat to four month highs. Until the corn and soybean crops are out of the ground there will be no double crop wheat planted in the eastern Corn Belt. Whilst the large spec trade is still short, they have trimmed their exposure somewhat this week according to data from the CFTC. Whilst profit-taking took some shine off the nearbys, new crop Dec 2010 closed 5 ¼ cents higher at 6.25 ¾, and March 2011 finished 6 ½ cents higher at 6.38 ½.
EU wheat futures extended their gains Friday, with November Paris milling wheat up EUR0.50 at EUR132.00/tonne, and London November feed wheat ending GBP2.00 higher at GBP105.50/tonne. Late profit-taking ahead of the weekend trimmed a little off earlier gains, which saw London November wheat hit GBP106.50/tonne, it's highest since July 24. Paris November milling wheat hit EUR135.00/tonne at one point, it's best since early August. Chicago wheat rallied to four month highs Friday afternoon, after gaining 10% this week alone as the US corn and soybean harvest is the slowest in at least thirty years. This will have a knock-on effect to wheat, as many farmers need to get their con and beans in to enable them to plant wheat. US October rainfall already ranks among the 5 wettest on record, not including the past 2 days. Two more storms in the next week should secure a record for October, 2009, says Gail Martell of Martell Crop Projections. London wheat also gained after the pound sank following the news from the Office for National Statistics (ONS) surprising the market by saying Q3 GDP actually fell 0.4%, contrary to an anticipated gain of 0.2%. That saw sterling nose-dive from around 1.6650 against the dollar in early trade to finish around 1.6300, a fall of 1.5% on the day.